At hand, a floating soundtrack to mysterious dreams, a journey through deep space, or a walk on a pillow of clouds down the endless spiral of consciousness along the translucent fence. Will I ever tire of such things? I don’t think so, especially when the work is crafted at such a high level as this. 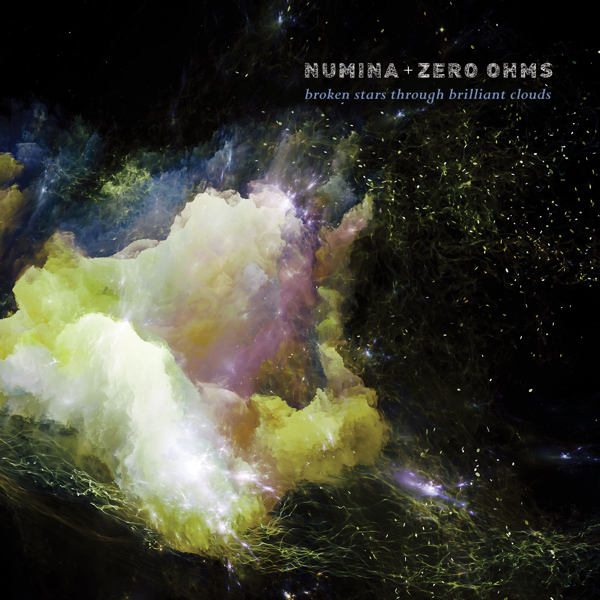 Both Numina (Jesse Sola) and Zero Ohms (Richard Roberts) have individually created numerous recordings using whatever resources they have to mold whatever sounds are needed to meet the necessary ends. It only figures that when these two masters collaborate that the result will be far greater than the sum of the parts. Using a wide variety of woodwind instruments, wind-controlled synthesizers, processed guitars, and electronics, as well as field recordings, Zero Ohms draws from a wide palette of sounds that, combined with Numina’s skill with synthesizers, acoustic instruments, and sound sculpting studio techniques, create stunning explorative soundscapes that simultaneously focus energy inward while infinitely stretching the boundaries of the imagination. Five long tracks guide the listener through an hour-long journey that gently crosses interstellar panoramas and spacefolds that shimmer and flow, sparking the imagination on waves of melodic color, shadow and texture. The sounds are warm, soft and comforting, so much so that when the last track ends the silence is cold and deafening, drawing your finger toward the replay button to repeat the experience over and over.